I'm not afraid to tell the truth, I'm afraid of the people unable to see it. so it was oct 17, 2017, around 6:25 pm. the sky had been clear of those long stringy stick clouds that are perfectly natural and harmless (chemtrails for those who’ve awakened from denial) for 3 days. when I was a kid I developed an interest in airplanes and their habits; I have always liked to look for the plane with the highest altitude I could find and wonder at how I could still see it and tell it was a plane. this day was no exception. I looked up and right away noticed a few. two in particular caught my eye. 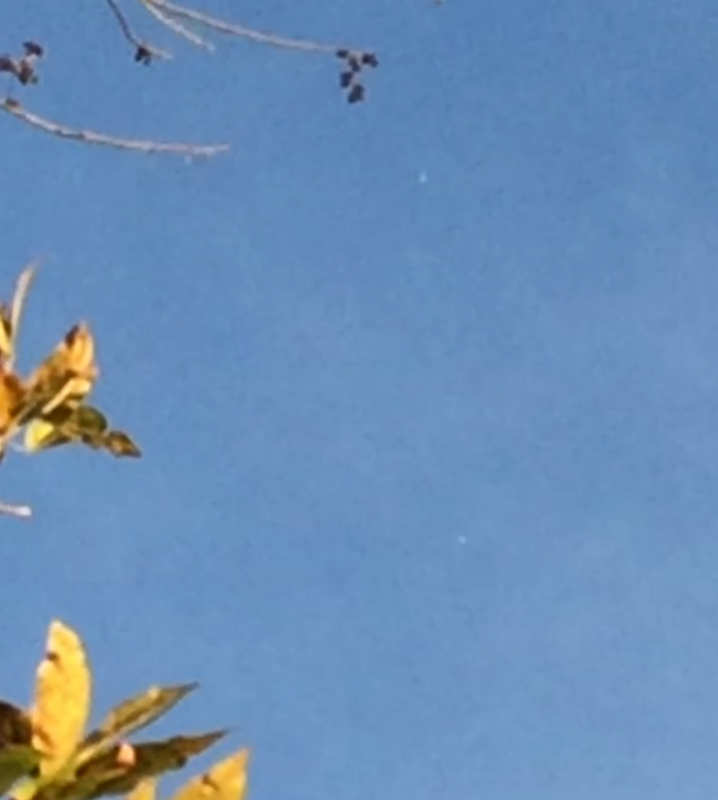 they were flying about 4 degrees of perception apart in the same direction. one pulled up next to the other. they didn’t have wings. not planes. I ran in and got my phone to record. you can see them in the pic, much clearer if you invert the color. they flew to that location and stayed there for nearly 10 minutes, directly above my head, I mean straight up. one flew there, I lost the other for a moment, then it followed into position. I yelled for my husband, got my binoculars. he saw them too. Higher in altitude than the highest plane, yet through the lenses I could see they were not planes at all. More like two gigantic tennis balls; spherical and citrusy yellow-green. what the fun?